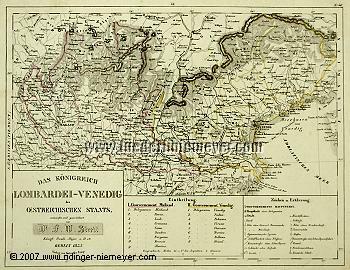 (Lombardy-Venetia of the Austrian State, The Kingdom.) With three-part simple cartouche for title, territorial division with miles + signs and symbols. Regional map by Frdr. Wilhelm Streit (Ronneburg, Thuringia, 1772 – Berlin 1839) in steel engraving colored in outline. 1835. 8½ × 11 in (21.5 × 28 cm). Disclosed up to highschools + universities , navigabilities + harbours , (arch)episcopal sees , artificial roads with and without express post. – Centred on Verona , still with Klausen . – Weakly foxing in the white margin.